This multifunction calibrator provides a feature set unmatched in high accuracy, hand-held calibrators in its price range. The mc-1210 multi function calibrator provides the functions and accuracy associated with fixed-installation, laboratory instrument, and has everything needed for virtually any calibration tasks. Measure and source thermocouples, RTDs, current, voltage, and frequency, and source pulse trains. A communications port compatible with both Fluke® 700 Series and Beta Calibrators pressure modules is provided, as is an isolated mA/V read-back circuit. Arrow keys, direct numeric keypad entry, and three software driven function buttons, plus a large backlit, menu-driven graphics display combine to provide a highly intuitive, simple yet powerful operator interface. 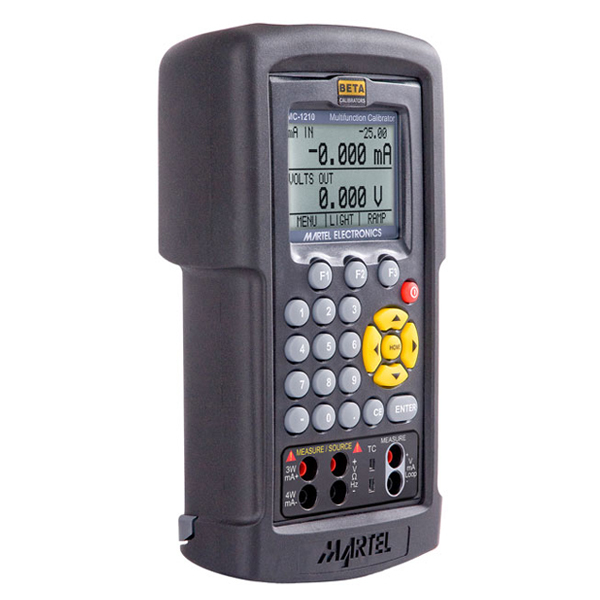 Built-in 250 Ohm resistor for HART™ compatibility, compatibility with smart transmitters and PLCs, full fuseless protection, are just some of the additional features that make the process calibrator the single most indispensable tool available for virtually any calibration task. This multifunction calibrator is supplied in a tough, rubber boot; a carrying case is also available as an option.